WESTPORT — A 14-month endeavor to envision the future of development, parking, and streetscapes in Saugatuck will come to a close next month, but polarization among residents and the project's consultants about what is best for the neighborhood threatens to unravel the effort at the 11th hour. Curry’s comments came after a contentious meeting of the Saugatuck Transit Oriented Design Master Plan Steering Committee Tuesday morning, in which the committee planned to review the draft implementation plan for Saugatuck, but achieved little in the way of concluding the envisioning process, instead rehashing old debates about parking and traffic in downtown Saugatuck and the nearby train station. Matthew Mandell, Saugatuck visioning committee member, resident and executive director of the Westport-Weston Chamber of Commerce, is a harsh critic of plans to develop Saugatuck and spoke more than any other person at the meeting reiterating his frustration with the plan’s support of single-story, bi-level parking decks at the train station. “I’m sorry to dominate the meeting, but I feel like I have a lot of things to say,” Mandell said, before questioning whether plan’s to add landscaping, a designated jitney and bus parking area, and a parking deck at the train station justify the loss of 100 currently existing parking spaces at the rail station needed to allow for the changes. “What is the impact of doing this in terms of urbanization, densification, and the loss of character versus beautifying the area and helping out the businesses to some extent with parking or are there other ways to achieve it without going to the deck?,” Mandell asked. A final report of the Saugatuck Transit Oriented Design Master Plan will be held Feb. 12 at 6 p.m. in the Westport Town Hall auditorium. Seth Shapiro, a principal with Barton Partners, the urban design and architecture consultancy firm that wrote the draft plan, pushed back on Mandell’s call to maintain the existing number of parking spaces at the station. “We began this process to create a transformative and positive benefit and vision for Saugatuck. One of the problems is that Saugatuck is over-asphalted, over-parked, and doesn’t have the right balance of public realm improvements, so we felt, in some cases, the desire to lose no parking is the status quo. We didn’t think we’ve spent the last 14 months to be reinforcing a status quo decision,” Shapiro said. A convenient pick-up and drop-off area, in addition to a more attractive jitney and shuttle service to the station, may offset the lost parking spaces, Shapiro added. Although there was minimal time for comment from non-committee members, Crooked Mile Road resident Geralyn Breig, a frequent attendee of the Saugatuck visioning meetings, said the plan should put less emphasis on a drop-off area and more focus on adding parking spaces for commuters, like herself, though not in the form of a parking garage. “My concerns are a parking garage will create a choke point that will add time to the commute on both ends. I think it’s also dangerous for women, which surface parking, in my opinion, is not,” Breig said after the meeting. Not all residents who came to the meeting oppose the plan’s parking structure. Tiered parking may be a worthwhile tradeoff if it helps achieve the total of the Saugatuck vision, Roger Schwanhauser, a Ferry Lane resident, said. “Things that sometimes may seem undesirable at the surface — if they have really good benefits, we need to consider those,” Shwanhauser said. 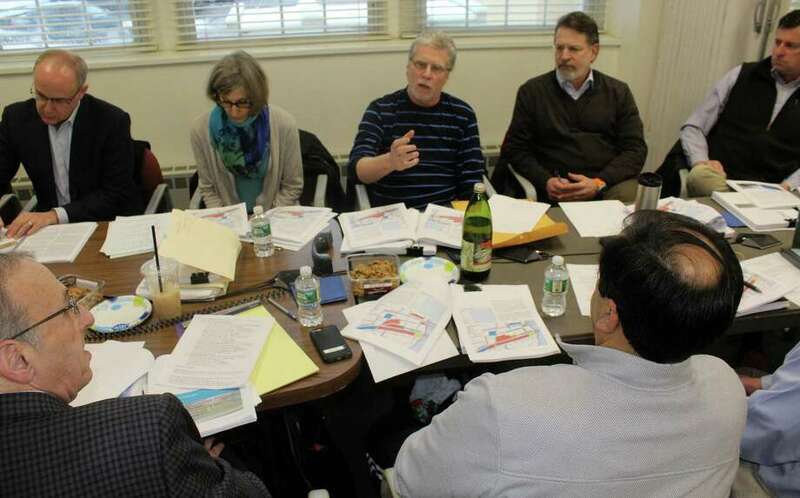 Randy Henkels, a Saugatuck committee member and Chairman of town’s Historic District Commission, also said he supports the idea of concentrated parking if it makes way for more public amenities, such as better pedestrian waterfront access. However, because the deck parking doesn’t increase the number of parking spaces and actually lowers the number of spaces, Henkels said the tradeoff is questionable. Despite the loss of parking spaces, committee member and resident Ward French said he still sees the parking deck as worthwhile because he supports, “doing anything we can to reduce the amount of asphalt” in Saugatuck. Public-private partnerships between developers and townspeople can accomplish the desired parking structures, French added. Indeed, “reducing the appearance of parking as the primary land use in Saugatuck,” is one of the committee’s guiding design principles, committee member Sam Levenson, who believes deck parking can contribute to that end, said. The 2017 Plan of Conservation and Development survey revealed 61 percent of residents agreed on a parking structure for the train station would be OK, Shapiro said but acknowledged the small sample size of respondents, about 200, may not be reflective of Westport’s entire population. Taking a step back from the details, French said the committee’s process has been flawed, but only because the expectations are so high. He warned against getting “hung up” on the plan’s details, which will need approval from other town bodies before they can ever manifest. A presentation of the final plan for Saugatuck will be held Feb. 12 at 6 p.m. in the Town Hall Auditorium.